By Roy Wollen, President, Hansa Marketing Services. New customers are either loyal advocates in training or a hole that will drain company resources from the moment they land in your database. Taking the long-term view of customer acquisition programs will give you tools to identify both types. The sad truth in our industry is that most new buyers never blossom into loyal fans and customer advocates. In fact, the majority of new customers never even buy twice. Different offers, channels, or seasons attract a different crop of new buyers. You would think it would be relatively simple to predict who will blossom and who won’t. We certainly put a lot of resources into marketing communications from welcome kits to catalogs to e-mails - you name it. It’s as if all one-time buyers are the same, receiving the maximum throttle of our attention until we run out of gas (perhaps one year into the relationship). Then, those customers who don’t buy again are slotted into the re-activation programs for next year, like my old Earth, Wind, and Fire cassettes that ended up in the discount bin of the record store (ok, I’m dating myself). Naturally, not all one-time buyers are the same. The trick is to recognize who will become your customer advocates, buying across channels and promoting your brand to friends and colleagues. But with only one or two days’ worth of history, how can you separate out promising first-time customers from the run of the mill, coupon-toting switchers, who’ll jump ship the moment a sweet offer comes from your competitor? Using a customer database, you can turn back the clock to analyze what happened to new customers, say, two years ago or even last year. These buyers were “new” once and will provide wonderful clues as to what your company did right. Those individuals who buy again are evidence of what works. Those that remain one-timers give you clues for what to avoid. What should you look for in your database? Here's a table of clues new buyers may provide. Each channel will attract a different crop of new buyers. - Affiliate program that generated this new customer Search engines and affiliates excel at generating new buyers, but don’t promote loyalty on their own. Do you know the Lifetime Value of online-generated buyers? - Type and number of list matches (match to rental) Expensive lists may pay off in attracting repeat buyers, but is it worth the cost? Original Date Day, month, and season of first purchase (even time of day) Look for radically different behavior for customers acquired during holiday periods (i.e., less loyal). Original Product - Number of items and number of different departments? - What product or service was purchased in which combination? This is one of the best predictors of repeat purchasing and loyalty. Make sure you don’t get overwhelmed with SKU level details. Original Amount Related to original product The higher the expenditure, the more likely a repeat purchase. Customers who are at twice the average should get a “thank you” phone call. First Out-of-Stock Experience - Was the item in stock? - If it was on back order, how long did it take to fulfill? - Was the merchandise kept or returned for exchange or refund? Customers are more put-off by how you deal with out-of-stock issues than the initial problem. - Point or mileage earning bonus Full-price buyers are indicating their desire for your product/service, not their affinity to a “deal”. - Geo-demographic cluster Some clusters simply work better, particularly if they are situated in or out of a trading area. Demographics Life stage indicators (age, income, children’s age, home ownership, etc.) Sometimes, demographics are very powerful, but you don’t need to overlay your whole database to gain insight. The long-term view of your customer acquisition program is a job for a customer database. Without one, success is solely measured on response rate and initial sales - not activations, repeat purchases, renewals, and loyalty. 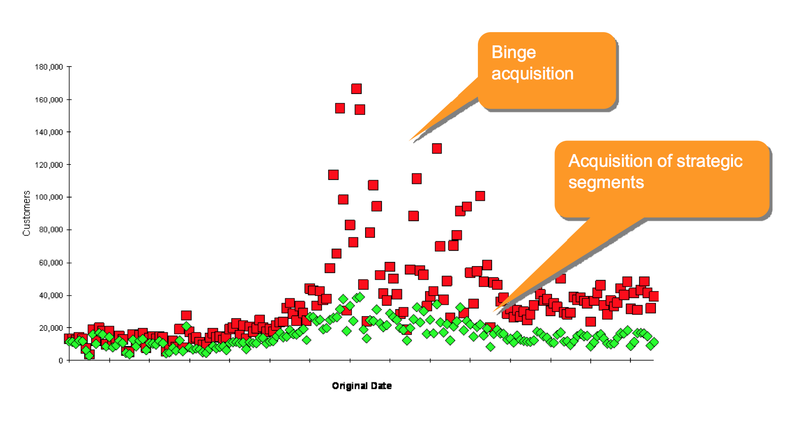 This leads to binge acquisition, where an acquisition manager is rewarded for simply bulking up a customer database. That’s a roller coaster ride with giant spikes of acquisition that may not go anywhere. The real success is not getting customers to go from 0x to 1x (no purchase to one purchase), but from 1x to 2x, then 2x to 3x+. The paradigm shift here is to focus on the best customers, then build customer acquisition programs around finding more of them. This starts with 3x+ buyers and works backwards. Velocity: Average time it takes new buyers to order a second time. Product Affinity: The kinds of products purchased on the first order and in what combination, then what was purchased next. Context and Influence: For b2b marketers, what else is happening at that site? Are there advocates to refer to? For b2c marketers, what else is happening in the household? Initial Offer: Bribery, premiums and discounts will often lead to high response rates, but will attract a disproportionate amount of 1x buyers. 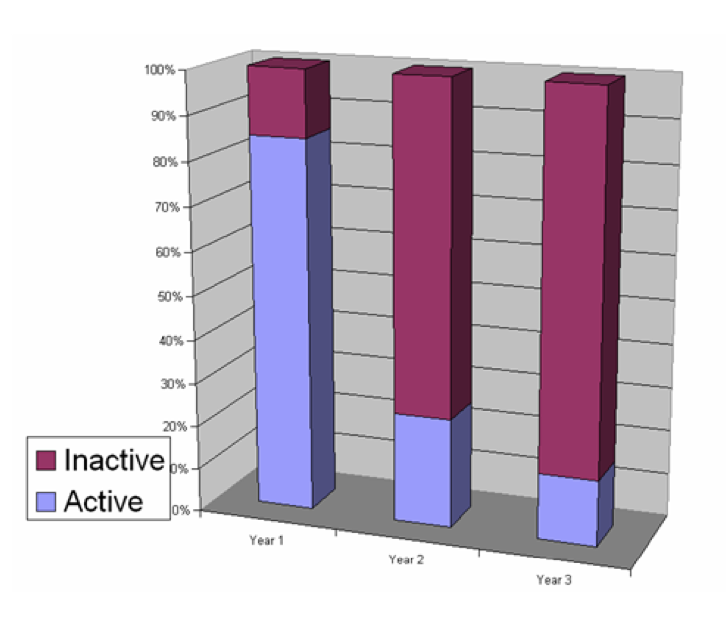 New customers acquired during promotional binges will bloat your customer database. Acquisition programs should attract the right customers. Study what happens after the acquisition event using facts from your customer database to guide you to the best new customers. Explore “clone” models that identify your best customers and track back to how to find more of them. Acquisition roller coaster. Resist the urge to get swept away by acquisition programs that produce high numbers of new buyers and stellar response rates, but become a drag on company resources after the initial sale. Track strategic segments. Reward acquisition managers for their ability to attract the right kinds of new customers. Establish profiles of who the target audience is based on Lifetime Value and attrition studies using empirical facts from your existing customer base. Keep your customer database clean. Duplicate records mean there are genuine repeat buyers masquerading as several one-time buyers. This causes over contacting and irrelevant communications (“Welcome” message to repeat buyers). These experiences will annoy your loyal fans and cost you money. Partner with your broker. Share your acquisition campaign results and Lifetime Value (LTV) work as input to their recommendation engines. Don’t accidentally dismiss sources with mediocre response rates but spectacular repeat purchasing and LTV.